Fax machines are declining in popularity as email and other forms of communication become more popular, but some users still require a solid fax machine for their home or business. If you are in the market for a fax machine, there are a few important things to consider before purchasing. While having a dedicated fax machine has many benefits, such as not tying up a machine for other functions, many modern offices choose a multifunction or all-in-one printer that has faxing capabilities built in. This allows for a more integrated solution, and offers features like PC Faxing for sending documents directly from a computer, as well as the ability to receive documents digitally over the network instead of having them print out. Whichever you choose, most of the important fax features will be the same. You will need to decide if you want an inkjet or laser fax machine. Laser faxes offer excellent quality text results and a low cost per page, while inkjets will offer a lower upfront price and less expensive supplies. Laser toner cartridges will cost a little more upfront, but last longer than inkjet cartridges will, reducing costs over time. You should estimate how often you are planning on using your machine to know what size monthly duty cycle you need. For instance, if you plan on faxing 20 documents a day, you are going to want something that has a monthly duty cycle able to handle a minimum of 600 pages. If you may only send one fax a day, a unit with a duty cycle of under 100 pages should be sufficient. If you plan on only faxing very infrequently, consider buying an all-in-one machine where the fax function is just an extra feature. Also, try to stay within the recommended monthly duty cycle of the machine, and not just the maximum, as it will mean better reliability for the device. Modern fax machines operate at a rate of 33.6 Kbps, with a protocol known as Super G3. Since these machines are also backward-compatible with slower connection speeds, there is no reason to purchase one at slower speeds. The machine will automatically compensate when transmitting to or receiving from a slower device. 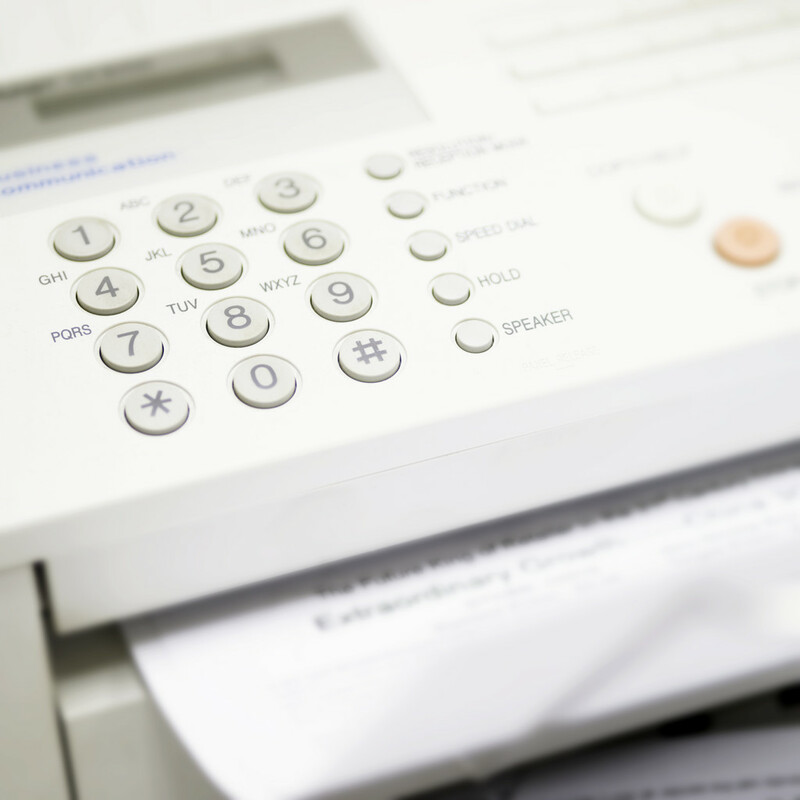 With Super G3 speeds, most fax machines can send a document in around 3 seconds per page. The size and capacity of the document feeder can be an important aspect of a fax machine. If you generally only send one or two-page faxes, a small document feeder will suffice. If you are in a law office that constantly sends 50 to 60-page documents on a regular basis, however, a larger document feeder will be essential. Having a flatbed scanner can also be useful for scanning stapled sheets or books that will not fit into the feeder. Many fax machines include a number of quick-dial or speed-dial buttons that provide easy access to the most frequently-used locations. For a busy office, this can be a real time-saver, and this type of buyer might want as many stored locations as possible. Home users, on the other hand, may only send faxes to a few numbers, making this feature less important. When comparing different models, you should research the other fax features available to see if they will apply to your specific needs. Fax Forwarding is a feature that can forward faxes to another number when you are away from the office, for example, but it may not be essential if you only need to receive them in one location. Some fax machines come with a built-in battery backup, but home users may not need to pay more for this feature when missing a few faxes is not that important. Whether you choose a small dedicated fax machine for the home or a multifunction behemoth for a busy office, the main factors are generally the same. By understanding your own needs and finding a device to match them, you can ensure you will be happy with your purchase for years to come.